Why is this spectrum band going largely unused? We Need More Radio Frequency Spectrum Than Ever. Why Is This Band Going Largely Unused? 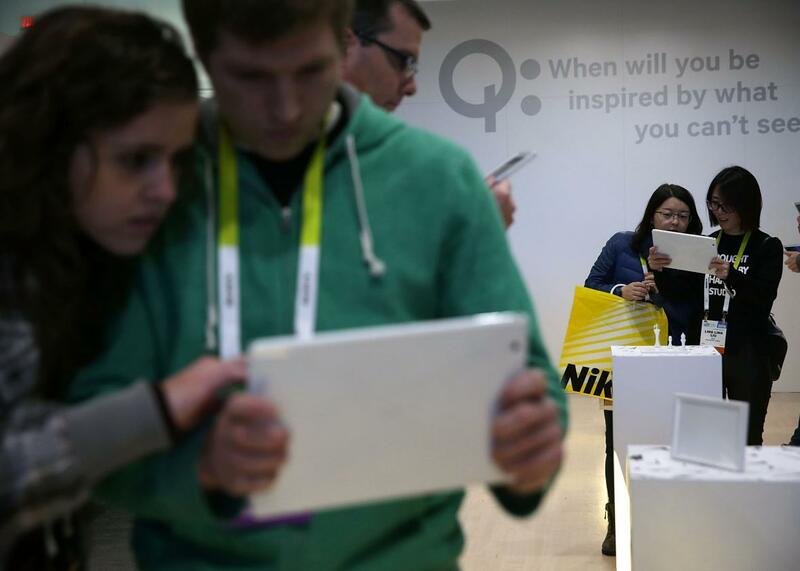 Show attendees participate in the Qualcomm Invisible Museum experience with tablets that show viewers different experiences of Qualcomm technologies—including the future of smart cities, Internet of Things, photography, robotics, and mobile experiences through augmented reality—at CES 2016 at the Las Vegas Convention Center. This piece was originally published in New America’s digital magazine, the New America Weekly. Like birds heading south for winter, every January, thousands of tech connoisseurs flock to Las Vegas for the Consumer Electronics Show to peek at the technologies of tomorrow. And this year, they could see that the “disruptive power of so many devices now comes from their wireless connectivity,” to quote Federal Communications Commission Commissioner Jessica Rosenworcel. Wireless connectivity—including Wi-Fi—is dependent on the existence of unlicensed radio frequency spectrum. Provisioned by the FCC, unlicensed spectrum are frequencies set aside for equal opportunity general public use, as opposed to being reserved for military purposes or auctioned to private or commercial interests. Despite initially being viewed by the FCC and commercial licensees alike as “garbage bands,” unlicensed spectrum has become the darling of innovation, and its public allocation has yielded many economic benefits and technological gains. Without unlicensed spectrum, there would be no Wi-Fi specifications and no Internet of Things, the network of physical objects embedded with connectivity—and a sector into which venture capitalists poured more than $300 million in 2014 alone. However, with soaring amounts of mobile traffic and an explosion in IoT devices (Cisco projects that, by 2020, there will be more than 50 billion connected devices in circulation around the world), existing unlicensed bands are becoming congested. And if these unlicensed bands become exhausted, future innovations might literally be crowded out. In twin keynote remarks delivered as part of “The Road to Gigabit Wi-Fi,” an event hosted Jan. 22 by New America to celebrate the release of a new spectrum policy paper by Michael Calabrese, Commissioner Rosenworcel and her colleague Commissioner Michael O’Rielly reaffirmed the FCC’s commitment to devising spectrum policies that champion unlicensed uses: “It’s no longer a question of whether but how to go about it” said O’Rielly. The event also included a panel discussion and a short presentation by Calabrese, its author. (New America is a partner with Slate and Arizona State University in Future Tense.) The paper, titled “Spectrum Silos to Gigabit WiFi: Sharing the 5.9 GHz Band,” examines the development of the 5.9 GHz “automotive” band, its potential for unlicensed uses, and competing proposals of Cisco and Qualcomm about how to best share the band with unlicensed devices. As the paper details, the 5.9 GHz band sits adjacent to the current Wi-Fi band and was set aside in 1999 for exclusive use by the auto industry for the development of intelligent transportation systems. Intelligent transportation systems include things like DSRC, or dedicated short-range communications,—a kind of technology that would allow cars to communicate vehicle to vehicle or with smart infrastructure in order to predict and avert collisions. However, despite its enormous value, this prime spectrum has largely lain fallow for the past 15 years. In contrast to the unpredicted font of wireless and Wi-Fi productivity, the foreseen safety-specific DSRC systems have failed to materialize. Instead, many modern safety innovations in the automotive sector, including crash-avoidance radar, sensors, cameras, and other driver-assist functions, operate outside of the DSRC band. Even the National Highway Traffic Safety Administration, which will tentatively mandate DSRC systems in all new models beginning in 2020, estimates that it could be 20 to 30 years or longer before vehicle-to-vehicle communication is fully adopted and effective. Furthermore, even when fully realized, safety-of-life DSRC services may not even occupy the full 5.9 band. And so what if, instead of reserving the 5.9 GHz band to an industry that is not using it to its fullest, it was opened to unlicensed uses? It could provide an opportunity for the creation of a “wider pipe” for Wi-Fi, resulting in superfast wireless capacity. Currently, the FCC is considering doing just that—which is why both chip-manufacturer Qualcomm and networking equipment manufacturer Cisco have offered the aforementioned competing technical proposals on how to achieve sharing of the band. In what is perhaps a testament to the increasing importance of finding new unlicensed spectrum, the FCC, the Department of Transportation, and the Department of Commerce recently joined forces to issue a letter promising to start joint testing of the two proposals, as well as prototype devices that would operate in the 5.9 band. As part of the event’s panel discussion, Mary Brown, senior director of government affairs at Cisco, and Dean Brenner, senior vice president of government affairs at Qualcomm, debated the respective advantages of their proposals. Of course, in discussions of band sharing, there are still lingering concerns about auto safety. Panelists debated how to best balance promoting innovations in the unlicensed space and safety applications in automobiles. Blair Anderson, the deputy administrator of NHTSA, defended his agency’s bullishness on vehicle-to-vehicle technologies, citing grave statistics about highway fatalities in the United States. Harold Feld, senior vice president of public interest organization Public Knowledge, made an impassioned speech about how automotive life and safety technologies were developing outside of and in spite of the exclusive allocation and how continuing to allow “spectrum squatting” was a disgrace. Ultimately, as demand for wireless technologies continues to grow, even with sharing of the automotive band, there will likely be additional challenges for the long-term provisioning of spectrum. Regardless of whether Cisco’s or Qualcomm’s proposal is adopted upon FCC engineering testing, there is consensus among the diverse stakeholders on a key finding of the OTI report: that that both DSRC safety-of-life applications and expanded broadband capacity for Wi-Fi would deliver important benefits for nearly all Americans. That’s a reality—and not the virtual kind on display in Vegas.